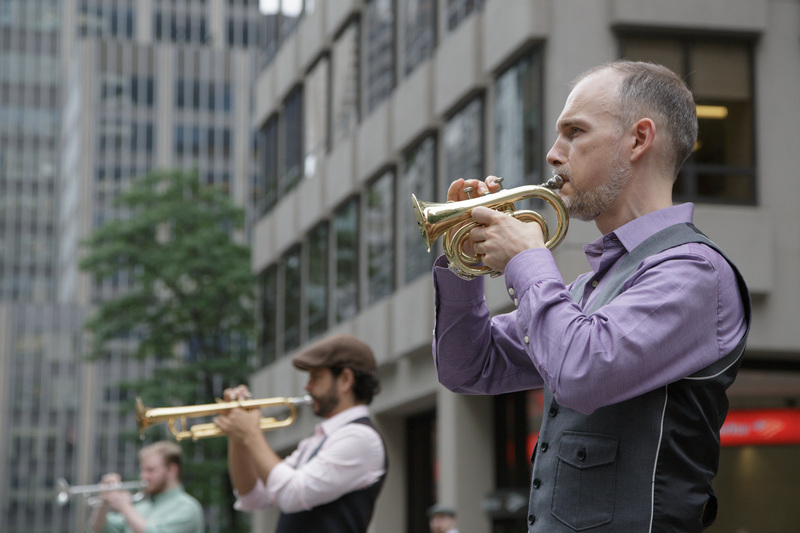 A New York composer is hoping to bring stillness to the busiest city in the world – by getting 91 trumpeters to play in Manhattan during the Summer Streets event. Trumpet City: Park Avenue will see trumpeters placed every 50 yards on both sides of the street, from 46th to 72nd, when the road is closed to traffic on August 2. Craig Shepard – who created the installation – said: “The piece was constructed keeping in mind that one can hear a trumpet roughly within 200 yards of the instrument. “By positioning trumpets 50 yards apart, the listener hears the closest trumpet as a solo, as a chamber group of the nearest eight or nine trumpets, and the hum of the cumulative sound of all the trumpets. Partly inspired by Christo and Jeanne-Claude’s The Gates in Central Park, Trumpet City: Park Avenue is the third in a series of one-hour live installations of multiple trumpets in a public space that Shepard has created, the others being in Switzerland, at Lake Zurich and Bern. Shepard said: “The Department of Transport manages the infrastructure that allows those of us living in New York City to do our work and live our lives. Summer Streets opens up that infrastructure for artistic work. “The Park Avenue closure is a very simple and powerful concept: by changing one aspect of our day-to-day lives – in this case closing the street to automobile traffic – it changes the way we inhabit the city. 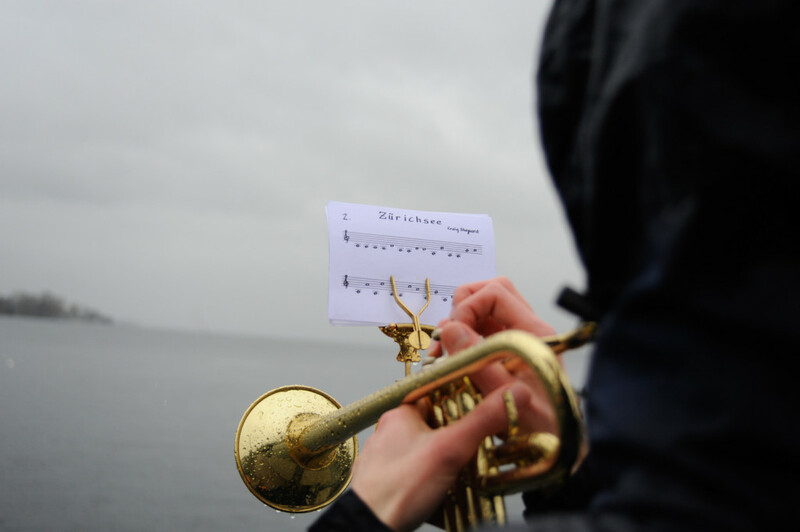 “Trumpet City invites people to listen to their own city in a new way. So many of us, especially in the summer, feel a need to escape from New York City. 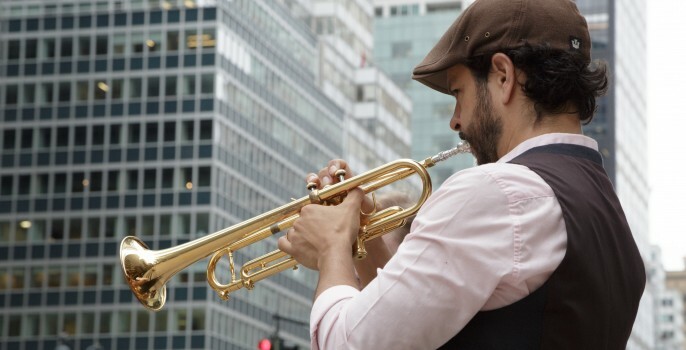 Trumpet City is an escape to New York City. “What I am doing is inviting trumpeters and passersby to a moment of contemplation: to be present on the street right where they are. Tracking down the 91 trumpeters to take part in the project was no easy feat – with Shepard spending around two hours a day hunting them down – but the Brooklyn-based composer says that he’s now turned the task into part of the creative process. He said: “First, I asked trumpeters Aaron Meicht and Phil Rodriguez, with whom I had worked in New York. They suggested other trumpet players who might be interested, including Steph Richards. 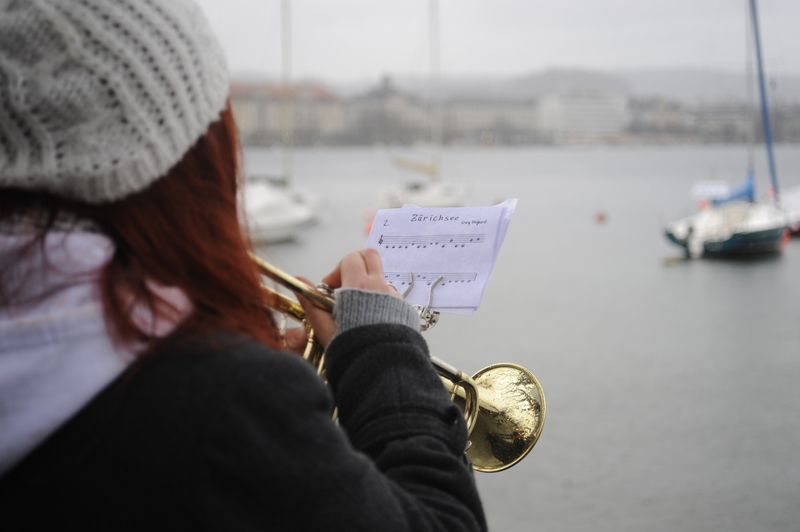 “Each time someone joined the project, I asked if they could recommend six trumpet players. When they replied, I kept asking for referrals. I’ve also reached out to schools in town: Rutgers, Juilliard, SUNY Purchase, and the Manhattan School of Music. 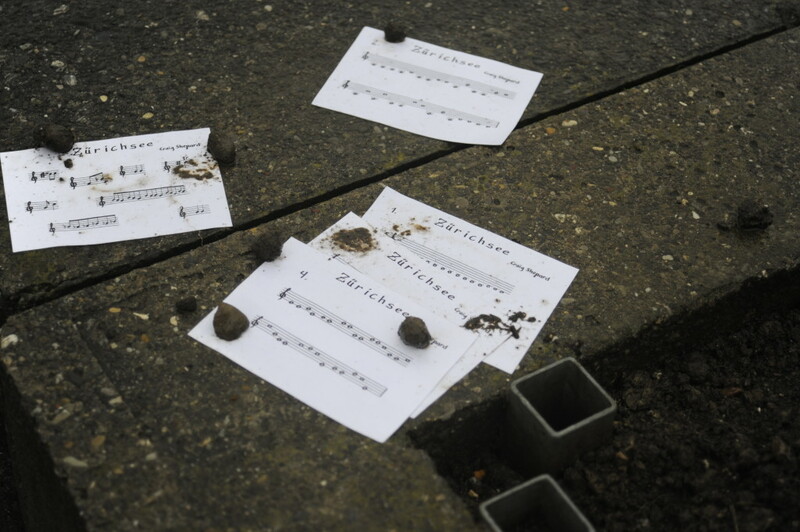 Shepard’s interest in stillness, and the music of stillness, began as a child when he heard Bach’s Contrapunctus I from The Art of the Fugue being played at school by a brass quintet. He explained: “I was passing through the rehearsal room to get to basketball practice. As I became aware of the music, for about 20 seconds, time stopped. I can still clearly remember watching specs of dust floating in a ray of sun shining through the window. “Then in 2007, I visited the Trappist Abbey of the Genessee in Piffard, New York. Upon returning to the city, it became very clear that there was a need for silence. For me silence is in the mind: it’s when the mind is still. There’s lot’s of ways to get there; music is one good way. “I recently lead a silent walk down Broadway. Times Square was packed, and when we passed through, it was a challenge to maintain my inner stillnes; until we reached Max Neuhaus’ sound installation called Times Square at 46th and Broadway. “The tones there frame the noise all around it. When I listened, everything became still. As I walked away, part of that stillness remained and if I take a moment, I can remember what that was like wherever I am. Shepard’s search for silence seems to run contrary to the noisy household he grew up in, where his five older brothers and he would often play individual instruments simultaneously in different rooms. He said: “I grew up in the suburbs of Hartford, Connecticut. My father is a musician and, growing up, there was music being made in every room of the house. My mother, who played guitar and used to sing to us, gave us free rein in the basement, and had a very high tolerance for sound. After Park Avenue, Trumpet City moves to Meeker Avenue, Brooklyn, on September 20, and a photobook on the project, by Beth O’Brien, is due to be published in the fall. Shepard has also a CD from his silent-walking project On Foot: Brooklyn, set for release in a few months, and runs a Music for Contemplation concert series in Williamsburg.